Providing additional protection against environmental hazards for their 30mm Emergency Stop Buttons, Banner Engineering has introduced their new Washdown Cover. The Washdown Cover provides extra protection without compromising device actuation or visibility. By raising the product rating up to IP69k, it expands the number of applications for which their E-Stop Buttons can be used. It's available in pre-installed kits or as a standalone product. Banner Engineering's 30mm-mount Illuminated Emergency Stop button is an electro-mechanical emergency stop push button. It meets worldwide safety standards. They are easy to install and hookup with no assembly, individual wiring, or additional enclosures required. 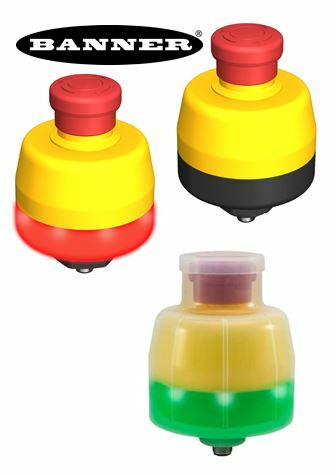 Banner's 30mm mount E-stop buttons have an illuminated base that turns from yellow to flashing red when actuated. To reduce down time, the red flashing illumination of the E-stop button visibly alerts operators which button was pressed so they can quickly and easily fix the problem and only reset the button that was activated. For questions or more information, please contact C&E at 800-228-2790. Thank you!